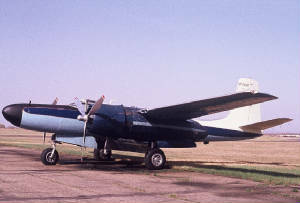 Delivered to French AF as 44-35708. - BOC: Apr. 18, 1954. - Returned to USAF, Nov. 10, 1955. - Open storage, Clark AFB, Philipines, 1955-1958. On Mark Engineering Co, Van Nuys, CA, 1963-1966. 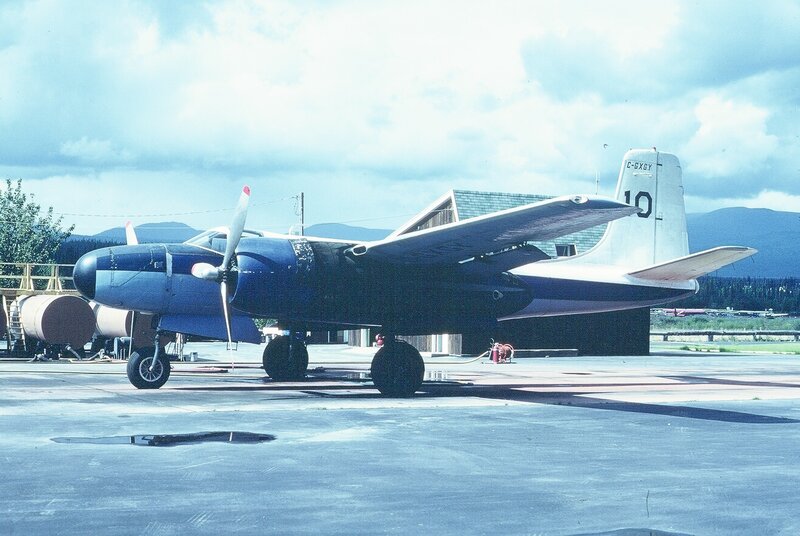 ( Referred to as the “ Blue Bird “ at On Mark ) - Registered as N5530V. Raytheon Manufacturing Co, Bedford, MA, 1969-1976. Air Spray Ltd, Red Deer, Alberta, Dec. 1976-2002. 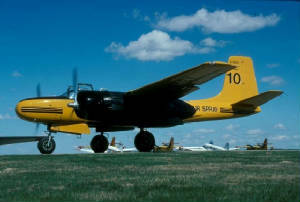 - Flown as tanker #10. Refurbished and now at Hillsboro as N26PJ ( since 2008 ). 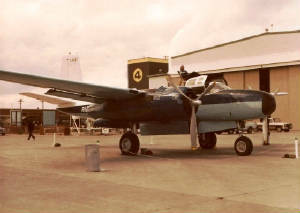 In 1963, 44-35708 was acquired by On Mark Engineering Co. of Van Nuys, CA and was converted into a civilian transport known as the On Mark “Marketeer” and gained the civilian registration N5530V. 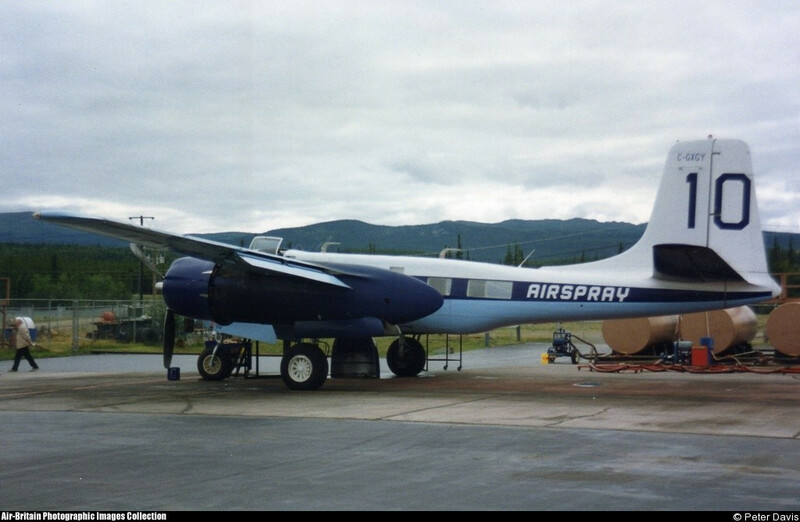 This aircraft was purchased by the Raytheon Missile Division in 1969 and used as an executive transport until October 25th, 1976 when it was sold to Air Spray Ltd. of Alberta Canada for $25,000. 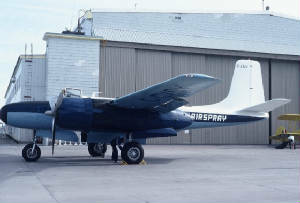 Air Spray re-registered the aircraft as C-GXGY and designated it Tanker 10. 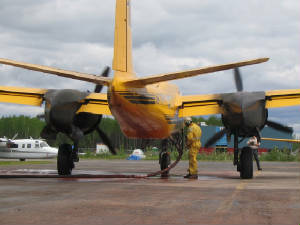 The plane was converted into a fire bomber by Aero Union and it flew fire suppression missions in Canada and the U.S. from 1976 until being retired from service in 2004. 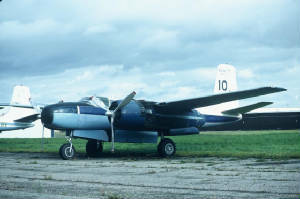 This was the last year Air Spray operated A-26’s and the entire fleet of some 14 aircraft was put into outdoor storage at their base of operations in Red Deer, Alberta and put up for sale. 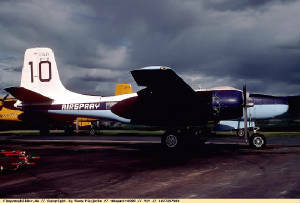 In May of 2006 representatives of the Classic Aircraft Aviation Museum traveled to Red Deer , Alberta to inspect the A-26 fleet and came away with an agreement to purchase Tanker 10 and Tanker 4. 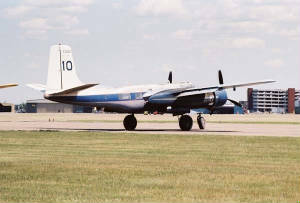 Tanker 10 was subsequently flown to the museum in Hillsboro , Oregon early in October 2006 where a thorough inspection was conducted. The aircraft was re-registered as N26PJ and on February 6, 2008 it was granted an airworthiness certificate in the experimental exhibition category. Current plans include maintaining the aircraft in an airworthy condition and making it available for both flying and static display at air shows.